Ayinger | Beer Apprentice - Craft Beer News, Reviews, Interviews and Info. Hello everyone. For today’s craft beer review I’m going to be trying the Ayinger Oktober Fest-Marzen produced by Privatbrauerei Franz Inselkammer KG/Brauerei Aying located in Aying, Germany. Since Munich has just kicked off their annual Oktoberfest celebration I figured that I should join the party by drinking this beer. I’m really looking forward to it also. For some reason this beer is not profiled on the website, ayinger-bier.de, so I’m going to have to revert back to ratebeer.com for the commercial description. Ayinger Oktober Fest Märzen has a deep golden color tinted with amber. It is lightly sweet with a malty nose balanced with floral hops. Its medium to big body and alcohol is not overpowering. The soft dryness comes from long maturation. This brew has an ABV of 5.8% and it comes in a 16.9% bottle. It poured a very clear, shimmering copper color. Tons of burnt yellow and orange highlights around the edges and along the bottom. The crown was off white, soapy and kind of fizzy. It formed to a pretty good size. It didn’t stick around too long though and not much lacing was left to speak of either. The nose was a tad bit simple with hints of toasted grains and toasted breads. Some sweet caramel malts added some complexity, but I honestly didn’t really find much else. Maybe a slight bit of earthy hops. The taste was somewhat sweet with more of the caramel malt leading the way. Savors of toasted breads and biscuits with a slight leafy taste. More earthy hops were found, however literally no bitterness was discovered. It was balanced well I must say. The mouthfeel medium bodied. Smooth, slick, dry and kind of crisp. It was almost refreshing to tell the truth. The carbonation was good, although not a terrible amount of flavor was left behind on the palate after the sip. Well, this was pretty much a typical Oktoberfest in my opinion. It was straight forward and to the point. The drinkability was very good and this brew would easily set the mood for a night of imbibing during the cool month of October. I don’t know that I necessarily think it’s the best Oktoberfest that I’ve ever had, but it’s definitely worth a try if you are making your way through the many of this style that are produced nowadays. 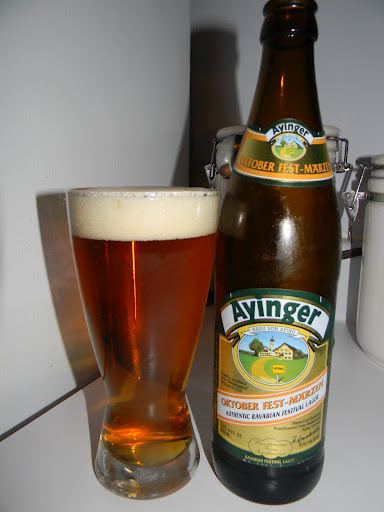 So, if you have had the Ayinger Oktober Fest-Marzen let me know what you thought. Feel free to leave a comment if you would like also.